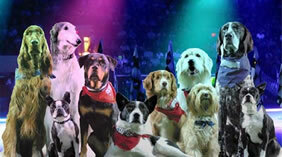 Did you see THE SUPERDOGS at the Calgary Stampede this year? They never fail to cause Poochmania wherever they go and this year's performances were no exception! Trained to run and jump at incredible speeds, and to jump to unbelievable heights, the achievements of THE SUPERDOGS are truly astonishing! They're great athletes... they're great entertainers...they're great dogs. 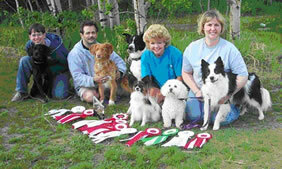 Most of all they're the great friends and family pets of over 250 amateur trainers who star in the many Superdog Shows across Canada and the USA every year. The dogs in the show represent nearly every breed and mixed breed imaginable and Herb Williams, the genius behind the popular Superdog Show, is proud to say that almost 40% of all SUPERDOGS have been rescued from shelters across North America. They have become the world's most popular dogs and there are several regular SUPERDOG team members who call the Superdog Spectrum home. Entertaining hundreds of people at Superdog Shows in Regina, Saskatoon, Toronto & Vancouver in August were Lori Boyle with Honey (owner of the Spectrum), Siobhan Boyle with Radar, Shannen Jorgensen with her Papillion Quartet and the Blonde Bouvier, Sherry Etifier with Phyllis Diller, Cooper & Chicletts, Dona Robbins with her team of multi-purpose Huskies, Kari Kerr with Sneakers & Golden "Brad Pitt", Tracy Garnett with Smudge, Julie Delarue with Dewey, Tofu & Max, and Paul Aziz with the "Collie Flowers" Treasure, Flint & Creed. OUR SINCERE CONDOLENCES go out to Jack & Shannen on the loss of Tegra, a really great dog. Tegra was a Nova Scotia Duck Toller who excelled in dog sports and will be sadly missed by many people. She is pictured to the right with Jack. To live in the hearts of those we love is not to die...rest in peace sweet doggie. In Agility, the handler directs his dog over, around and through a set course of complicated obstacles. Dogs are judged by how successfully they complete each obstacle and how well they follow the pre-assigned course. Each dog performs off-leash, accompanied by his handler who directs him with voice commands and hand signals. Agility involves jumps, climbing obstacles, weave poles, tunnels, and a pause table. Each dog is timed and the dog/handler team, who completes the course fastest, and with fewest errors, wins. Jumps. These can include winged or wingless jumps, a suspended tire, or whatever else competition organizers devise. Climbing Obstacles. The dogs walk along a beam, climb an A-Frame, and negotiate a teeter-totter. To officially complete the task, they must touch the yellow paint at the end of each climbing obstacle. Weave Poles. These are a series of upright poles that the dogs literally weave between. They begin by entering the weaves with the first pole on their left shoulder and weave through to the end. 2 Types of Tunnels. The dog runs through one or both types of tunnels in an agility course... a solid accordion-style tube or another type known as a chute. The chute has a barrel at the opening with collapsed material attached, running to the end...kinda like a really big wind-sock lying on the ground. The dog must burrow through the collapsed material to the exit. Pause Table. As the name suggests, the dog must mount this table and then remain still for 5 seconds before continuing. This can be a challenge for an excited dog who often just wants to keep going. Superdog Spectrum offers an Agility Training Program to help owners and their dogs master the ins and outs (and ups, downs, and arounds) of agility training & competition. This specialty program starts with a class for puppies...the Basic Athlete...and, upon graduation from that class, the puppy can progress through a series of classes to the Excelling Athlete level. 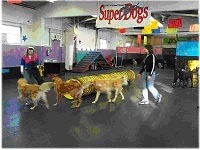 What's Happening in the SUPERDOG SPECTRUM Dog DayCare? Over the past summer, one of our Dog DayCare Dogs had a real life "Canine Survivor" adventure. Zoey, a Shih Tzu, went to visit the family farm in Saskatchewan with her mother, Anita. While playing outside with the farm dogs, Zoey suddenly and mysteriously disappeared...here one moment, gone the next! The family launched an intensive 22 hour search, but poor little Zoey was nowhere to be found. So, filled with hopelessness & despair, Anita returned to Calgary without her. Then a miracle happened. Five days after she went missing, Zoey returned to the Saskatchewan farm! Somehow the very dirty, exhausted little city dog had survived her ordeal in the country with nothing worse than a minor eye infection! Happily Zoey is now back at the Superdog Dog DayCare where the staff, Tylene, Branden, Tescha, & Sarah are amazed at the happy ending to such a horrible nightmare and we all marvel at the survival instincts of even the smallest of canines. New Furry Faces: Charlie, Gordie, Wallace, Bella, Pinot & Kerner, Jesse & Tika, Sydney, Cally, Parker, Bridget, Diddy, Luke, Picot, Dakota, Suzi, Lulu, Niemo, Joey, Bailey, Cocoa & Taco, Max, Arlo, and Riley. Welcome to you all! As of this writing, Sam the Weimaraner has had his cast removed and he is on the mend. In his mind he remains fun deprived, but his dad knows best and so Sam is resigned to taking it easy for now. He will soon return to the regular routines of Dog DayCare rather than being restricted to the office. Rumor has it that during Sams recovery, his dad even moved his own mattress to the floor so Sam could still sleep with him without having to risk jumping on the bed. In my next life I wanna be Sam!! CONGRATULATIONS to some of the Spectrum's CLASS GRADUATES! Ruby, Zeke, St. John, Pavlov, Bella, Sadie, Neko, Beaker, Lady, Molly, Max, Sass, Mabel, Wriggly, Chief, Velvet, Cally, Sawyer, Molly, Ebony, and Riley have all graduated from classes at Superdog Spectrum over the summer. Our apologies to anyone we missed. As your puppy grows up, it is increasingly important that he respond reliably to the "come" command. But, how do you direct your puppy to the adult dog response we all dream of? How do you get your maturing puppy to turn immediately in your direction when he hears you give the "come" command (or in my own case, "herrrrrrrrre"), run to you as fast as he can and slide into the sit position at your feet? When you call your pup to you, often you'll be calling him away from something fun. One reason your pup will leave something fun to come to you is because you are MORE fun. This means you may have to give him sincere and abundant praise, a food reward, or a favorite toy. Stress the positive! Pups link what they are doing with the word they hear when they are doing it. This means that if you yell "come!" when your pup is chasing a squirrel he may think "come" means to chase squirrels. During training, only use a command when you can make sure it can be completed. This ensures that your puppy associates the command with the correct response. The "come" is an important command because it can help keep your puppy safe. The RADICAL RECALL CLASS, which begins a new session at the Superdog Spectrum on Sept. 16th and October 28th, will help you & your dog understand and perfect this important aspect of basic training in a safe learning environment. Building and perfecting the "come" command is a great gift to yourself and to your maturing puppy. According to data from Veterinary Pet Insurance Co., veterinarians most often treat ear infections in dogs. The company reviewed claims its clients filed in 2004 to identify the top 10 reasons dog owners took their pets to the vet and found that 9 percent of all claims for dogs were submitted for ear infections. Dogs are pack animals who need a leader to look up to. As the owner of a dog, you're the pack leader, and both of you need to know your roles. By about six months of age, most dogs have reached an awkward adolescent stage (some dogs don't reach this stage until their second year.) In this stage, everything you've taught your puppy seems to be forgotten. During this time, the young dog wants to test his rank, to see whether he can take over as the boss. There are some things you can do to reinforce your position as the pack leader...you have to do a lot of positive training and help your young dog understand his place. Remember, praise is VERY important. A dog expects a hierarchy within the family, as well as in a pack. It must be clear to all members of the family that the dog is the last one in the family hierarchy. Suppress any signs of aggression with suitable measures as soon as they manifest themselves. Although it might be amusing to see how your puppy defends his bone, don't tolerate this behavior. It's much more difficult to correct an existing misbehavior than to prevent it from the beginning. Dogs that are not put in their place from the beginning can be a real problem once they are one or two years old. However, this will not be the case when you start a consistent training program with your puppy. And remember, it's not just the dog who's a student and has to learn everything...the human must also learn. You must behave in a way that allows the dog to do what he's expected to do. You can learn these things and much more at the Superdog Spectrum's Canine Communication Class.